We plan a short hike to the Toadstools for the day. About 25 miles West on 89 we park the car and start walking along the creek as described in the guide. After less than a mile we see the first of these toadstools and then shortly thereafter we see them all. It’s an impressive site. A toadstool is a formation which has a boulder perched on a rock column, like a mushroom. It is formed over millions of years when the softer rock under the boulder erodes away, leaving only the rock pedestral supporting a capstone. The toadstools represent two geologic layers separated by millions of years. The top layer (Dakota Formation) was formed around 97 million years ago. The bottom layer (Entrada Formation) was deposited approx. 160 million years ago. The layer inbetween, the Morrison Formation, completely eroded away before the Dakota layer was deposited. This break in the sedimentary geologic record is called an unconformity. As it is still early we try Cottonwood Canyon Road again and today get maybe one mile further than yesterday before we end up in front of a mudhole that is too deep for our Jeep. Back on HWY 89, looking at the map we see that not much further west the Paria Canyon Road departs south and eventually connects to HWY 89a – off we go! The first half of the distance is very fascinating, all these colorfull rocks and steep mountains – very impressive. The second 15 miles are rather boring and long. We are glad to eventually reach HW 89a. 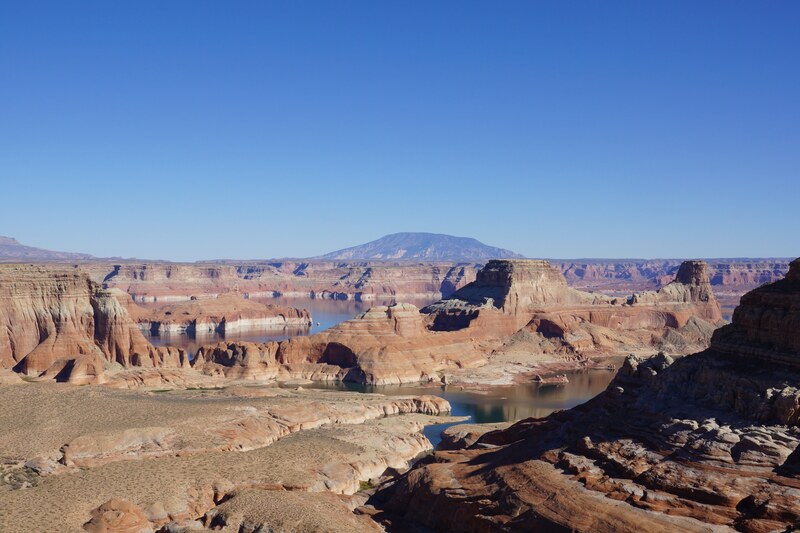 It leads us along the Vermillion Cliffs through Marble Canyon back to Page. At the end we are both very tired as the whole trip turned out to be much longer than we planned for. Anyway, looking at the pictures in the evening we have to conclude that it was still worth it! We turn the BBQ on again and enjoy delicious spareribs for dinner!